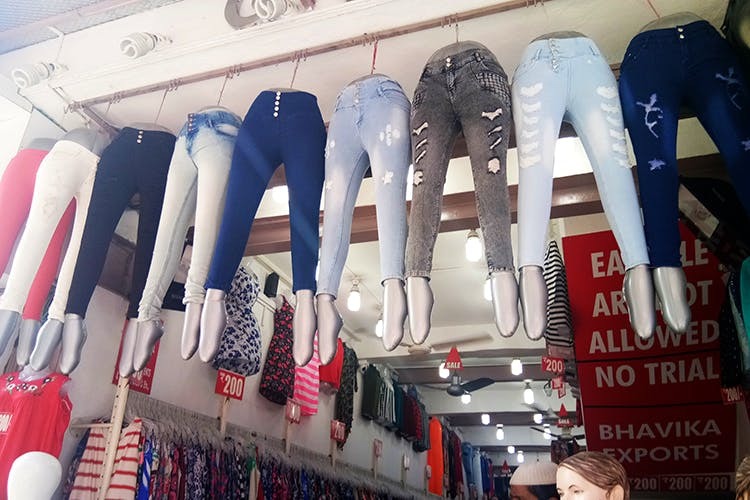 Popular with the college crowd, Bhavika Exports is a great place to pick up denims on a budget. Apart from jeans, you can also pick from a fabulous collection of denim tops. There’s no better place than Commercial Street to snap up export surplus stock from a variety of fancy brands. On Ebrahim Sahib Street, there’s Bhavika Exports that’s spread across a few shops. While they do sell the customary wardrobe options, we recommend you focus solely on the denim offerings at Bhavika. They store has neatly piled rows of jeans. From skinny to ripped, you can get them all here. While most of them are from local brands, we saw plenty of happy customers who had no problem finding the fit or the style they were looking for. Prices start at INR 600 for the smaller sizes and go up to INR 700 for the larger ones. Bhavika also has other denim options. We saw off-shoulder, faded denim tops with cute patches sewn on. We also spotted denim shirts with prints and others with pleats. Their sleeveless shirts and dainty tops featuring stone work too are great buys at INR 200, we think. Do make it a point to check for quality and if you can try them on, over your clothes, before buying. If you are looking for plus size options, you better look elsewhere since sizes do not go beyond 38. Also, we think these jeans work best for college kids who are looking to stay on trend while not burning through their precious allowance.